- Flat 15% off* on your first order when you log in. - Offers & updates on fresh Indian fashion trends. - Seamless sync of wishlist on all devices. - Faster browsing and checkout while you shop. - All your orders & status updates in one place..
Get flat 15% Off on your first order. Get Flat 15% Off on your first order with us. A warm welcome to the world of authentic Indian fashion. Here's your first gift- A flat 15% off* on your first order with us. Dont Wait - Use NEW15 . Online lehenga cholis, salwar kameez, sarees shopping made simple and easy! At Utsav Fashion, we have a well-researched pricing policy and believe in offering the finest products at competitive prices. However, should you happen to chance upon your chosen product being displayed at a lower price in any other site, we will match it - before or after you buy. How you can Claim the Matched Price? Take a snapshot of original product from Utsav Fashion with price mentioned. Take another snapshot of the competitor's price of the same product. We will check all details and if the product is authentic you will be sent a revised custom payment link of matched price. Price match is not applicable on any Stitching Charges. In case of price match, clubbing of any other live promotion or, discount will depend on case to case basis. If we match the price we will refund the differential amount to your account. In case we are not able to match the price and you wish to cancel the order, we will cancel the same and issue a 100% refund to your account. Measurements listed are garment measurement. 1. 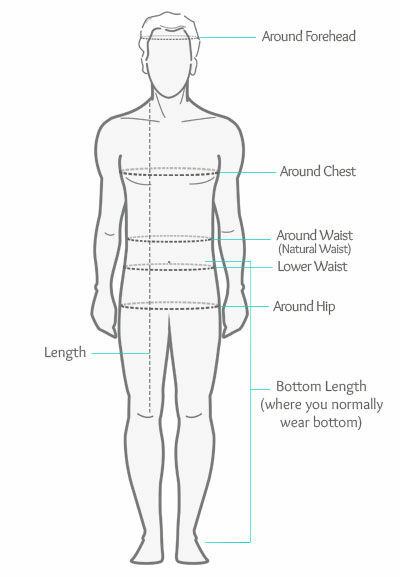 Please follow the instructions below to get your exact body size and then compare it to our body measurement chart to see which size fits you best. 2. Keep Measurement tape firm, but not tight. 3. Ask someone to assist you while taking measurement. Length: Measure length from the shoulder point to your desired length like shown in the image. Around Head (Turban): Measure around your forehead and go across the ears, and under the base of your skull. You can always submit your measurement after placing the order. For now, just select Customize with Made to Measure, click Add to Shopping Bag and complete order. Later on go to Account section, visit My Orders page and submit your latest measurement. I was very happy with the product, had a lovely shopping experience!! Apr 18, 2019. Thank you Utsav Fashion!! I got my all orders. My experience is really really good and I like my all orders. I will give 5 / 5 rate scale and yes I'm really happy to shopping with Utsav Fashion. Apr 18, 2019. A lovely array of choices, wonderful experience so far!!!! Apr 18, 2019. I bought it for my husband! It was a perfect fit! Fabric was really nice and as described!! Apr 18, 2019. Excellent fitting!! All dresses came on time!! Very happy with my purchase!! Excellent service! Apr 17, 2019. © 2019 Utsav Fashion. All Rights Reserved.